This worked well with BH3 and we’re doing the same on BH4. All new items have been dropped and are on the game grid. The Elixir Storage was upgraded, Gold Storage still needs to be upgraded but there’s a little time on that so I focused first on other elixir upgrades, specifically the Star Laboratory. At BH3, the key troops were Sneaky Archers and Raged Barbarians; I took them up to level 6 at BH3, maxing the key troops as the hyper-rush upgrade guide requires. BH4, though, introduces a change in attack strategies for me as I move to Mass Beta Minions (MBM). So far, I have the Beta Minions up to level 5 - on the way to level 6 here in a few hours - and I’ll take them all the way to level 8 before I even consider upgrading to BH5. Defensive structures are a mix of level 1 and level 2. I took the builder time to repair my Clock Tower and Gem Mine. They offer very little to the game but they are additional structures and HP for the enemy to take down and the more you have down on the game grid, the more your opponent has to destroy to get a higher percentage. As I continue to work on the Beta Minion upgrades, I’ll get some more defensive structures upgraded as well. I’d like to get the Crusher and Tesla to at least level 2, maybe level 3, before the upgrade and Archer Towers, Cannons, Double Cannons…those are all inexpensive upgrades that only take a few hours to complete, so they’ll all be upgraded relatively quickly as well. As I mentioned, all of my attacks so far have been BArch - 2 camps each, Raged Barbarians and Sneaky Archers. This attack strategy has served me well through to early BH4 and produced right about 3 wins out of every 5 battles, but as we progress into the higher trophy ranks it will start to become less effective. When we finally see BH5, it will definitely be weak as the MultiMortar will hit the ground troops heavily. As such, it makes sense to shift to air attacks. To be successful at the BB, you have to ride the wave of the meta. This is one area where many players fall into frustration and, I believe, one of the biggest reasons for the complaints we see on the forums. If you plan ahead well, you’ll succeed. The game is currently running about 1300 trophies (1310 at the moment), which yields 215K/day in resources. This is enough to keep things humming and a steady pace, so not much complaint there. As soon as we have level 8 Beta Minions, we should be able to cruise up to the BH4 sweet spot of 1800 trophies. Every BH level has a sweet spot in the trophy rankings where it can maintain on just daily, loot winning attacks. BH4 is 1800, BH5 is 2500, and BH6 looks to be around 3400. This will no doubt adjust when BH7 is released in a week or two, but it is largely expected that new loot caps will extend into the 3000-4000 cup range so we may actually see all of the sweet spots move up a bit. 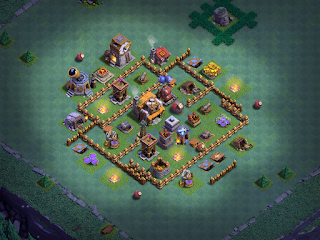 This base utilizes both pathing and misdirection against its opponents. The vast majority of attacks I am facing from other BH4 players are ground based; every so often, I’ll get hit with an air attack but it’s infrequent at best (only 1 of the last 10 in the Battle Log). Most players in the 1200-1600 trophy range are still working on upgrading troops and it seems like ground attacks are favored for some reason, although level 8 air is far stronger. So, this base is designed to bounce troops about, split them up, and lure them into attack junk buildings while defenses fire on them from afar. Even tricklers have a difficult time with this base. The next few days will be focused on defensive structures/traps/mines and continuing to upgrade the Beta Minions. There’s no particular order to the upgrade path here - I’ll start longer running upgrades when I need to be away from the game, shorter running upgrades when I’m just hanging about the house. In the early stages of the game, the order in which you upgrade structures is less critical to your ability to win matches than it is starting at BH5. At BH5, we see a lot more air attacks; as such, prioritizing air defenses - as well as defenses that hit both air and ground - makes sense. Beta Minions have 3 upgrades to run - 280K, 320K, and 360K. The attacks to get these resources will drive the timing for my other upgrades. Today’s attacks will provide the elixir for the level 6 upgrade; tomorrow’s attacks plus what I get from the Elixir Collector will be JUST enough to start the level 7 upgrade. The level 8 upgrade, though, will have to wait until Tuesday earliest. I’ll upgrade the Gold Storage Monday, while I’m working on getting the final bit of elixir I need to upgrade the Beta Minions. That will give me around 800K in gold to use on defensive structures; BH4 won’t be maxed before making the jump to BH5, but it won’t be far from it. My next update will be close to the end of the week as I pull the pin on the BH5 upgrade around Thursday. By then, we should know if we’re rushing to BH6 or BH7! As always - thanks for reading and thanks for watching!